Wyke has started to endear himself to Sunderland fans with a string of admirable performances up front. He notched another goal, and was credited with the assist for Max Power after a fine move down the left hand side. With the system debate in a pendulum between 4-4-2 and 4-5-1, it's possible that after Saturday's defensive disaster Jack Ross will abandon 4-4-2 which has otherwise looked a threatening set up. Should that happen, let's hope Wyke keeps his place as he continues to outshine League One record signing Will Grigg. Getting rated below average and managing to be second encaptulates the team's overall showing. That is despite scoring four goals. Whilst he won't have much of the blame to contend with for our defensive shambles, he can't exactly be commended for his defensive performance. Once again he was a threat in attack, looking one of our most creative outlets - which is why he has been rated more favourable than the rest of the team. It has been a while since we've seen such a disasterous defensive display from a pair of centre backs. Neither Baldwin nor Flanagan have covered themselves in glory recently, but this was on another level. It was incredible how many times both players put themselves under immense pressure by getting simple passes completely wrong, and after the first few Coventry goals went in they looked petrified of everything and everyone. One thing that shouldn't go under the radar is that they received absolutely no support from the central midfielders who struggled to control the game, but both centre backs need to take the lion share of the blame for Sunderland shipping five and missing a fantastic opportunity to pull away from Portsmouth and Barnsley. 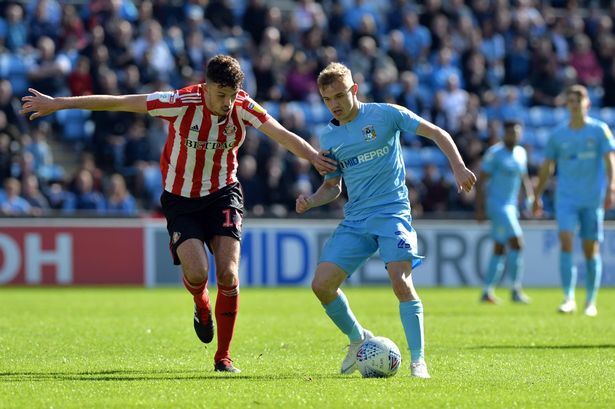 Lewis Morgan (5.7), Jon McLaughlin (5.2), Aiden McGeady (5.0), Will Grigg (4.8), George Honeyman (4.8), Kazaiah Sterling (4.6), Max Power (4.6), Grant Leadbitter (4.6), Luke O'Nien (4.0).